The Arès Pilgrims do not trust in politics and are aware that it's no good letting themselves be crucified by it (Rev of Arès 29/5), so that they want to vote. Freely. They vote rightist, centrist, leftist, according to which party they each weigh up is less detrimental to the ideas revived by The Revelation of Arès. But all of a sudden something new erupts in politics. I don't take sides, only I observe that Nicolas Sarkozy is trying, ineptly for the time being but it may get better, to unhook France from the barbed wires of its own innumerable, paralyzing, contradictory law and outmoded concepts, so that it may run freely again, creative and thriving. Without creativity together with prosperity, the left, or the center, or the right can't by no means be successful. The very men that accuse the president of "wanting to be a king," of "posing a threat to civil peace," of "selling off citizens' rights," may be some day the first benefitting whatever he opens the way to. 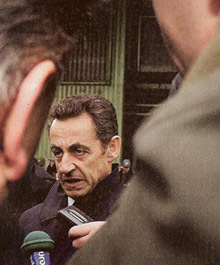 At the 2008 Farming Fair Mr Sarkozy allegedly hurled at an objurgator that declined to shake hands with him, "Hotfoot it, you stupid poor jerk!" Hmm, is it really shocking? My feelings aren't hurt, as I have always been mumbling to myself, all day, "You stupid poor jerk!" What sounds promising to me is the unbridled exchange of words and ideas in France where anything really dynamic hasn't been seen for long. Heraclites said, "Polemos (fight) is the father or king of all things (in the system)." For millennia Adam's system has been developping through arguments in religion and politics — The "sects" or "cults" business in France is just the umpteenth fear, the umpteenth dispute therefore, about a fundamental question, "What hurts the powers and what do they benefit? That's just demagogs' cookery. The changed world (Rev of Arès 28/7) will not be disputatious, but harmonious. Meanwhile, let's hope for some good from the controversies about Mr Sarkozy, as we will long have to put up with the system while we keep busy making it weaker and weaker through penitence, which sets us free, and which will unable us to gain Mastery (18/3) of the world by free good men, who will sooner or later replace the current masters (18/2) of the law of the rats (XIX/24). The protests, abuses, mockeries given rise to by Mr Sarkozy's postures, give parties and all citizens opportunities of rekindling their own thinking on a lot of main points and even, although quite unexpected, on The Revelation of Arès, don't they? On February 22, "Sud-Ouest" ("Southwest"), a paper, joined the bickering on "sects" or "cults" rekindled by an interview of Emmanuelle Mignon, a presidential adviser, and issued a big baloney about L'Œuvre du Pèlerinage d'Arès (The non-profit association that manages the Arès Pilgrimage). Nothing but one more baloney? Yes, but it gave me one more opportunity to send the newspaper manager a correcting mail, which may, when added to all the corrections I've sent "Sud-Ouest" since 1978, help the press and its political emulsifiers better to understand a question, not the least, among all of the questions which are no doubt for a long time bound to stay smudged by clichés and prejudices, because "blackening" is a job that gives high living, or thrills, to a lot of people, whether they blacken the President or blacken unassuming penitents like us.